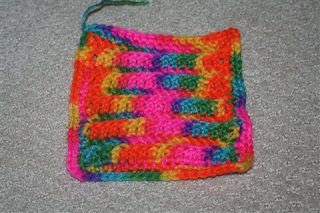 I have been busy crocheting blocks for the Block Party, and I decided to try knitting a square. I started it in Saturday, and finished it yesterday. It doesn't seem like it took me that long, but I could have gotten three or four squares crocheted in the time it took me to knit one square. But if I keep practicing my knitting, I will probably get faster. 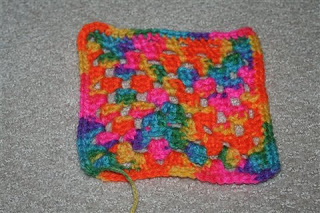 For the square, I casted on 20 (I would do 18 next time), with size 11 needles, using 2 strands of yarn. I knit every row until it was square. Below are some pictures of my knitted block, and some other blocks that are crocheted. 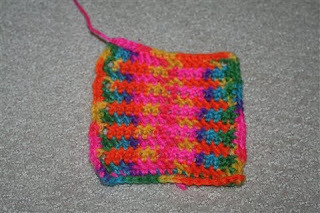 A Basic Square - it is double crochet with single crochet around the edges. 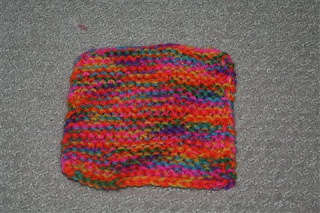 The yarn looks like it is totally different than the knitted square, but I used the same exact yarn! The edges aren't woven in on some of the squares yet, but I will weave them in when I get a chance. A square that I made working in rounds instead of rows. The pattern for it can be found here. It is the second one down from the top, called In the Round. 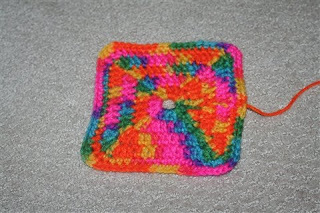 Here is a basic Granny Square - I learned to do this kind of square from this YouTube video. I would also recommend checking out her website! She has alot of good tips, patterns, and videos to help crocheters! This is the same as the basic square that is in the picture above, but I only worked in the back loop of each stitch. You can kind of see the ridges. If you would like to have any of these patterns, please let me know! That square that you made in rounds looks really cool! I love it! Thank you! It takes alot of pratice! When I first started crocheting a year ago, it took me a half an hour to do one stitch, and now it takes me 2 seconds! It takes alot of pratice! And I have no talent in scrapbooking, drawing, painting, or anything like that. Oh, and what you said yesterday about taking naps being on top of your activity list - my mom is right there with you! Everybody Wants to Help! Including Dad!